At the beginning of the Civil War, Georgia ranked third among the Confederate states in manpower resources, behind only Virginia and Tennessee. With an arms-bearing population somewhere between 120,000 and 130,000 white males between the ages of 16 and 60, this resource became an object of a great struggle between Joseph Brown, governor of Georgia, and Jefferson Davis, president of the Confederacy. Brown advocated a strong state defense, but as the war dragged on Davis applied more pressure for more soldiers from Georgia. 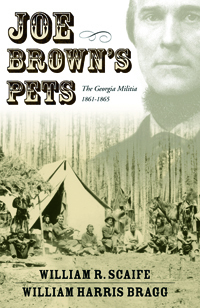 In December 1863, the state’s general assembly reorganized the state militia and it became known as Joe Brown’s Pets. Civil War historians William Scaife and William Bragg have written not only the first history of the Georgia Militia during the Civil War, but have produced the definitive history of this militia. Using original documents found in the Georgia Department of Archives and History that are too delicate for general public access, Scaife and Bragg were granted special permission to research the material under the guidance of an archivist and conducted under tightly controlled conditions of security and preservation control.